Over 161 laps, the 2018 Bathurst 1000 had it all; battles throughout the order, experienced drivers losing their cool, late heartbreak and a fairytale ending. After just over six hours of racing, the 2018 iteration of the 1000 broke the record for the quickest race by just under ten minutes despite three appearances from the safety car, a testament to the speed of the track and cars. Another Great Race in the books and no one could argue that Sunday’s Bathurst 1000 was anything other than a great race. 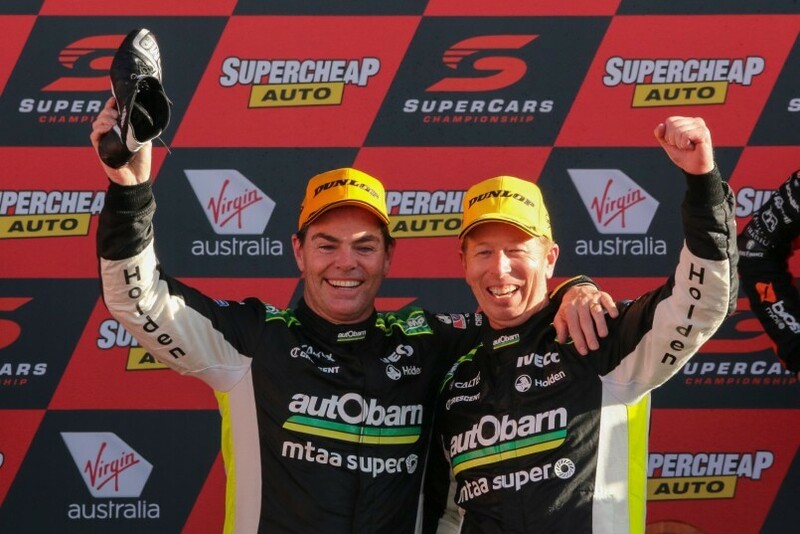 Craig Lowndes and Steven Richards came in to the 2018 Bathurst 1000 race with ten wins between them and looked like they’d have a leisurely farewell race together after power steering dramas kept them in the garage throughout practice. When the issues were sorted out, Lowndes was able to get himself into the top ten shootout for the first time since 2014, ending up ninth on the grid. Chipping away at the top pecking order throughout the race while their rivals fell by the wayside, the #888 car kept moving forwards, even after Richards nearly bogged the Commodore at the pit entrance. Vintage Lowndes was on display in the last stint, putting in flawless laps to take and retain the race lead. The victory, from garage 05, is Lowndes’ seventh and puts him two wins behind his mentor and Bathurst legend, Peter Brock. Richards’ part in the victory won’t be forgotten, moving himself on to five victories in the Bathurst 1000, now fourth on the all time list and only two wins behind his father, Jim. Scott Pye and Warren Luff produced another attack from the back for the second year running, ending up on the podium after starting outside the top ten in a performance which emulated their 2017 effort. Pye was kicking himself to only qualify the #2 car in 18th place, making for a very unhappy Walkinshaw Andretti United team after the squad expressed their disappointment at Pye’s team-mate James Courtney *only* qualifying in eighth. Luff as the super-sub jumped in for the opening stint and made up a handful of spots against a majority of the main drivers. The #2 car had genuine pace throughout the race and fought its way to the front, putting in a flawless drive to end up runners-up for the second year running. Pye has had a stellar year with a win in Melbourne and now another podium at Bathurst, cementing himself into ninth place in the driver’s standings. Scott McLaughlin and Alex Premat may not have won at Bathurst but third place on a day where the car had no pace is a victory in itself, especially in the bigger picture of the championship. Coming in to Bathurst after taking pole last year but retiring just 76 laps in, McLaughlin and Premat wanted redemption in 2018, doing well to qualify in fifth on the grid as the best of the Fords in the Falcon’s last stand at Mount Panorama. It looked like a long day at the office was in store for the #17 car, being off the pace of the leaders and having a brake rotor change issue which dropped the pair down a few stops. Despite this, Premat found himself in the lead throughout his stint and handed the car over to McLaughlin in a good position for his triple-stint to the finish. A lonely drive which only saw Chaz Mostert come near McLaughlin gave the Kiwi his first podium in a Supercar at Bathurst, narrowing the points lead of Shane van Gisbergen in the process. While the pace of the Falcon shows McLaughlin is the underdog heading in to the final three rounds of the championship, don’t think he and Premat won’t be going at 100% in the run to Newcastle. David Reynolds and Luke Youlden rocked up to The Mountain as the defending champions, wanting to go back-to-back after their heroic underdog effort in 2017 earned the pair a maiden Peter Brock Trophy. The weekend got off to a great start with Youlden topping the dry practice sessions and Reynolds just grabbing pole for Sunday’s 1000km race. A perfect start resulted in the #9 Erebus car leading a majority of the race with both Reynolds and Youlden holding off the hard-chargers behind them. Emerging in the lead for the final triple-stint of the race, Reynolds looked to have everything sewn up, enjoying a decent lead to Lowndes while setting a new race lap record in the process. However, towards the end of his second last stint, everything started to go wrong with Reynolds complaining of cramping in the car, losing pace and the lead thanks to the problem. It looked like Youlden would replace him in the final stint but Reynolds stayed in the driver’s seat, making the mistake of spinning the wheels in his pit stop which earned him pit lane penalty. The struggling Reynolds was pulled from the car and Youlden jumped aboard to bring the car which could have won or finished on the podium home in 13th place. Questions have been raised over whether Erebus took duty of care for Reynolds as he was visually hurting, beating himself up for letting the team down after the race. Anton de Pasquale and Will Brown were the rookie sensations at Bathurst on Saturday in the top ten shootout, not only doing well do get into the battle for a starting position amongst the quickest drivers in the field but ending up in third on the grid. A rocket start from de Pasquale saw all of Erebus’s Christmases come at once, leading their cars placed in first and second positions. However, the elation was short lived as the passenger door of the #99 car kept popping open, forcing the team to pit early and put Brown behind the wheel. Everything seemed sorted when it was shown that the door issue had not been fixed, earning the car a mechanical black flag and forcing them to come in again to sort out the problem. A solid day of fighting back through the order and staying out of trouble was unfortunately undone after de Pasquale’s final stop, wiping the walls at Sulman Park and McPhillamy Park on cold tyres. The incident happened around the same time as Reynolds dropping back through the order, compounding the dramas for Erebus. de Pasquale and Brown undoubtedly performed well but the crucial mistake at the end of the race threw away any chance of a standout performance. Jamie Whincup and Paul Dumbrell have been burning the midnight oil at Bathurst, searching the pit garages for the black cat which keeps plaguing them at Mount Panorama. As arguably the quickest pairing in the paddock, Whincup and Dumbrell entered the 1000 with renewed confidence after dominating the Sandown 500. A gamble to not partake in the wet practice sessions paid off when Whincup put the #1 car on the first row of the grid for the race, only 0.0096 down on the pole time even after an issue at turn one. As usual, Whincup was fighting at the front in the opening stanza of the race, handing the car over to Dumbrell in the first stop stop in prime position to make up spots. Dumbrell struggled early on after a safety car restart, not getting into a groove before the right front wheel parted ways from the car on pit straight, dropping them down the order and losing a lap to the leaders. In typical Whincup and Dumbrell fashion, the pair worked hard to get back on the lead lap, though a few issues under brakes at the Chase almost put a full stop on their day. Somehow, Whincup was able to get up to tenth in the final laps after producing one of the biggest fightbacks in Bathurst history. The pair will be left to rue what might have been given their undeniable pace had the wheel not fallen off their campaign. After their Bathurst triumph, Lowndes and Richards now lead the Enduro Cup standings, looking to go leave a five-year partnership with a swansong. Next is the Gold Coast 600, the final round of the Enduro Cup and the third last of the season. Held around the busy Surfers Paradise Circuit, the party round kicks off on the 26th of October.